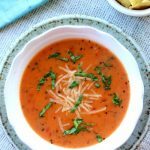 A creamy tomato based soup that is made from start to finish in 45 minutes thanks to the help of your pressure cooker. This is my favorite soup to make for company. I always get tons of compliments. I don’t believe I’ve tasted soup at a restaurant that is as good as this version. Turn your Instant Pot to sauté to allow it to warm up while you’re preparing your vegetables. Add the oil to the pot. Add in the onions and saute for 3 minutes. Then add in the carrots and celery and saute for 1 more minute. Pour the broth into the pot along with the crushed tomatoes. Add in oregano, basil and bay leaf to the pressure cooker. Cover the pot and turn off the sauté function. Make sure the valve is on “sealing.” Press the manual button and set the timer for 5 minutes. When the pot starts counting down from 5 minutes (it will take about 10 minutes to come to pressure) melt the butter in the microwave or on the stove top. Once the butter is melted, whisk in the flour a tablespoon at a time. It will form a thick mixture. By this time the Instant Pot will probably have beeped. Let the pot sit for about 5-10 minutes. Then move the valve to venting. Once the pressure is released you can open the pot. Turn your Instant Pot to the saute function. Ladle one cup of the hot soup into your flour mixture. Whisk it well. Then stir in the creamy mixture into the Instant Pot and whisk until combined. Let it cook for a few minutes on the saute setting (stir regularly, it just needs to cook out the flour taste). Add in the milk and the Parmesan cheese and the salt and pepper. Whisk. Taste at this point and season to taste. Ladle into bowls and serve with crackers.